I am devastated at news of the loss of Apollo 12 & Skylab II Astronaut, Alan Bean (March 15, 1932 – May 26, 2018). 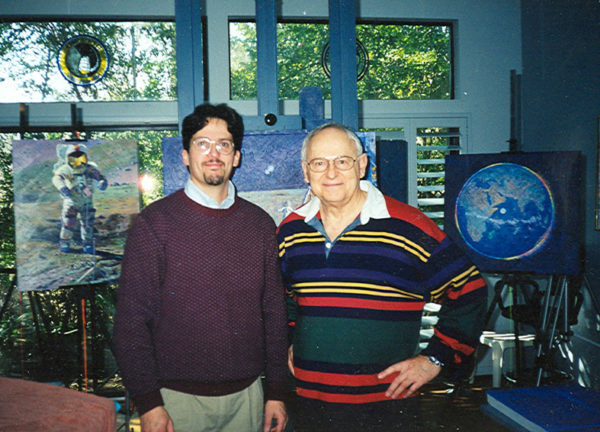 Alan Bean was a hero in so many respects, as a Navy test pilot, an astronaut, 4th man on the moon during Apollo 12, commander of Skylab II living in space for 59 days, an amazing artist and an incredible wit, but most importantly he was a dear sweet human being. Someone with a childlike sparkle in his eyes who genuinely enjoyed life and the people he met. He was touched by the beauty of our planet, humanity, and all life and that awe at the wonder of creation was contagious. His joy and good humor are irreplaceable. There simply will not be another like him. I was incredibly fortunate to know him for about 20 years and cannot possibly recount all the wonderful conversations we had over the years. There was a sincerity and genuineness about him though that, irrespective of any particular conversation, always shined in him that I will always carry with me as long as I live – he was truly a beacon in this world. I first met him in person during a visit with him at his Houston home and studio in 2000. Though we had corresponded through the mail and by phone before that this was one of the best days of my life – I was so fortunate speak with him at length about his career, see some of his space memorabilia, his incredible paintings, the flag from his spacesuit he cut up to include threads in his paintings… so fortunate throughout the years to see him at various shows around the country and share a meal or a drink… all these great memories I can’t begin to recall right now… I can’t express what a joy he was to be with.